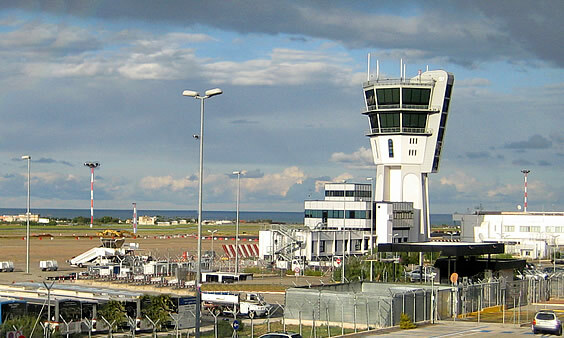 Bari Airport is a single terminal airport that was completely overhauled in 2007 and now sits on a 30,000 square meters area. It is located some 11 kilometers or 6 miles from the city of Palese. This airport is also known as Karol Wojtyla Airport, a name borrowed from Pope John Paul the Second. There is a modern general information helpdesk located in the Departures Hall and it is equipped with touch-screen computer displays provided by Totem Web Point technologies. Here you can access information concerning flights plus other useful data about the tourism, cultural and economic aspects of the Apulia Region. Despite its considerably small size Bari Airport boasts a good number of shopping facilities. This includes 20 stores dealing in electronics, cosmetics, books, newspapers, tobacco, Italian specialties, toys, wines, mobile phones, travel items, and so forth. Duty-free shops feature amongst these outlets. If you need to withdraw some money this terminal offers several ATMs from different firms. There is also a full service bank, the Banca Antonveneta to be precise. The SEAP Lounge which is located in the Departures Hall is suitable for people who need to meet for business or hold press briefings. It is usually open from 0500hours to 2100hours and has small meeting rooms and offices. Special to this airport is the Prayer Room which was consecrated by Pope John Paul the 2nd in February 1984. Every EU Airport, according to EU airport regulations, is supposed to have facilities for the disabled and accordingly Bari Airport has made itself very disabled-friendly. All persons who require special assistance in this regard are always kindly requested to inform their airlines of this as they book their flights. This information will then be relayed to the staff at Bari Airport thus allowing for the necessary preparations to be made. 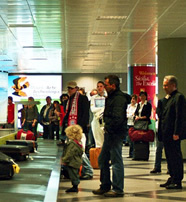 A typical scenario is whereby the disabled person is greeted on arrival at the airport, assisted with baggage check-in, and guided to the right boarding area. There is a special shuttle bus/ambu-lift to help the passenger board the aircraft and the personnel remain on standby until the passenger is safely onboard. There are also 45 special parking spaces that are marked conspicuously as so and these are located nearest to the passenger terminal. Speaking of parking lots, Bari Airport boasts an elaborate parking system with a total of 2300 spaces. The short-term parking lots are designated P14 and P4, and they are located directly in front of the passenger terminal. The PM parking lot is located behind the short-term lot. Long-term parking spaces are designated P2 and P3. Parking at the PM costs €6.00 for the initial 6 hours or €14.50 for the day, while P2 and P3 cost €9.30 for the first three days. There is also the P15 that is quite far from the terminal. It has less than 200 spaces and parking is free. For your transport off Bari Airport there is a Taxi stand in the Arrivals Hall. The journey to Bari costs €20 and it takes about 25 minutes. There is also a car rental desk in the same hall and it hosts several companies including Avis, Hertz, Thrifty, Targarent, Maggiore, Europcar, Quicar and Win Rent. The airport is also served by Amtab buses which leave every hour and also the Tempesta shuttle buses but which are more expensive.